Does comedy hypnotist shows really work? Home » Blog » Do comedy hypnotist shows really work? 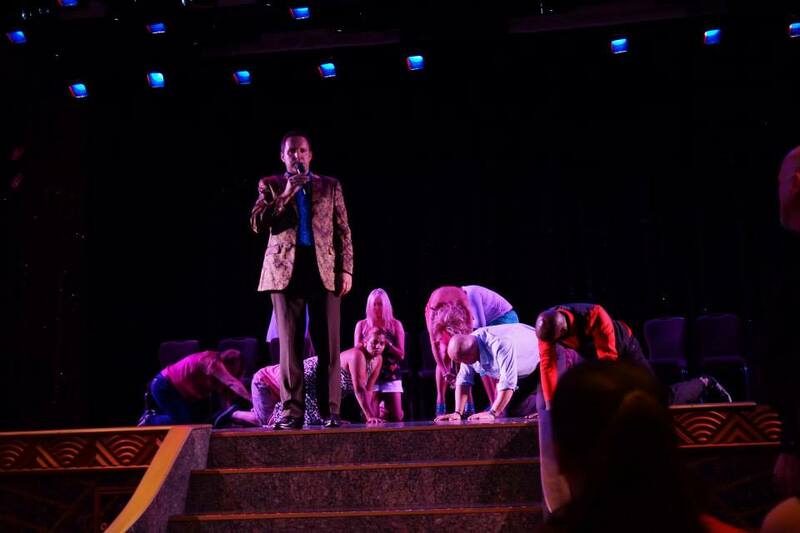 Picture this: You’re at an event or on a cruise ship when a hypnotist takes the stage. Your instant feeling is skepticism—a feeling you most likely share with the majority of your fellow audience members. You probably ask yourself: how does this work? Is this man a skilled hypnotist or simply a performer? 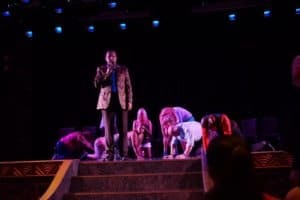 He takes the stage and chooses members of the audience to get involved, explaining that they will be hypnotized while the rest of the audience watches. You’re intrigued, so you stay seated, hoping to see if that skepticism goes away, or if the whole thing is just for theatrics. Before you make a decision to leave, you are sucked in; the show is hilarious, entertaining, and making you laugh harder that you have in years. Then, the actual hypnosis begins and you suddenly feel yourself becoming a believer. But those who have yet to sit in that audience and experience the first-hand effects of a comedy hypnotist show may not believe that stage hypnosis is anything more than an act put on for the audience to have a laugh. But the truth is in the show: comedy hypnotist shows work. Hypnosis at its’ core is a way to help people overcome fears, neurosis and bad habits. Many people seek out hypnosis when searching for a solution that doesn’t involve medications, surgeries or other invasive procedures that have risks and can harm the body or the mind. One simple hypnosis session has the ability to change everything from everyday woes, like weight control and sexual confidence, to more serious conditions like anxiety and depression. It can even be used for the simplest things, such as improving your golf game or getting over a small fear. There are many hypnotists out there who claim to be experts in the field, but only a few have the skills to not only use hypnosis as a cure, but to also use it as a means of entertainment. Richard Barker, commonly known as the Incredible Hypnotist, began his career as a Royal Green Jacket in the United Kingdom’s elite forces. After serving, he went on to get a Master’s Degree in Education, which allowed him to hone in on the skills needed to coach and teach hypnotists. For over 20 years, Barker has been performing comedy hypnosis shows in over 28 countries, while also working with private clients and becoming an expert on the subject, writing two bestselling books about stage hypnosis and hypnotherapy. So when you sit in the audience of an Incredible Hypnosis comedy show, you’re not only watching a performer and a comedian, you’re also watching a true hypnotist at work. Many performers feel that they can influence an audience to do whatever they wish, but it takes a trained hypnotist with a true understanding of the human mind to put on a successful hypnosis comedy show. Having charm and a good stage presence are just small characteristics of an effective stage hypnotist. Knowing how hypnotism works is a vital quality needed for these types of shows to be successful. There are a few tricks that hypnotists use when working with a large audience. While hypnosis is a skill, the person being hypnotized must be open to the therapy in order for it work. In private sessions, an individual, while they may be unsure about the full benefits, are clearly willing to give hypnosis a try. An audience poses a more difficult feat: many audience members may be there out of pure curiosity, while some may think the entire thing is a scam. It’s the scam mentality that comedy hypnotists try to stay away from. In fact, a skilled hypnosis comedian will scan the audience, choosing members that seem to be open to the idea of hypnosis. As the show begins, the hypnotist will actually create an induction process, which helps him see which volunteers will work best for his show. When done correctly, this process is so simple and streamlined that audience members won’t even realize it’s happening. Once the volunteers are selected, the real show begins. The point of a comedy hypnosis show is to entertain and to make the audience laugh. So, unlike a private session, the hypnotist comedian will focus less on fixing ailments and more on encouraging the volunteers to do silly things. At an Incredible Hypnotist show, the audience will also interact with the volunteers, while listening to current music, focusing on trending topics and watching it all occur in a safe, clean environment. The audience can expect to be entertained by Richard Barker as he puts on a fun and entertaining show centered on the process of hypnotism. The show is fast-paced and usually lasts between 45 and 90 minutes. During the show, Barker will hypnotize his volunteers and then proceed to get them to do silly tasks such as momentarily fall in love with him or find something, such as shaking his hand, utterly disgusting. The volunteers wake and begin to do these things on command. The result is a light-hearted and hilarious show that is great for all types of organizations. After one of Richard Barker’s shows, even the biggest skeptics are eased into the idea of hypnosis. And even those who still have a bit of skepticism leave with aching ribs from an hour of laughing. People of all ages and backgrounds will find something in common with this show, and as Barker keeps every show fresh and new, fans can see multiple without witnessing any repetition. Hypnotist comedy shows are great for everything from school events to company parties and Barker always creates a show that is relevant and appeals to the audience in front of him. If the idea of a hypnosis comedy show seems captivating, consider booking a show with the Incredible Hypnotist. You can book a private show for a school, party or event, or find experiences happening near you.